The ’17th Textile Asia: International Textile and Garments Machinery Trade Fair’ will begin at Karachi Expo Centre on Tuesday (today). The 3-day fair is being organised jointly by Pakistan Readymade Garments Manufacturers and Exporters Association (PRGMEA) and Ecommerce Gateway Pakistan. “65,000 people from trade and corporate sector as well as over 1,500 foreign delegates are expected to visit the trade fair,” said PRGMEA Chief Co-ordinator Shaikh Muhammad Shafiq, speaking at a press conference, here on Monday. He said that the focus of this trade fair is value-addition in textile industry to increase the export of value-added textile and garment products. “The trade fair that will be concluded on Thursday, is being termed as the Pakistan’s biggest fair of textile, garment, embroidery, digital printing machineries and chemical and allied services,” he said, adding that more than 1,000 international brands will display their products in over 800 booths and over 1,500 foreign delegates from 27 countries mainly from Austria, China, Czech Republic, France, Germany, India, Italy, Korea, Taiwan, Turkey, UK, USA etc, will grace the event. PRGMEA Chief Co-ordinator said that ‘Textile Asia Conference 2017’ will also be held in collaboration with Textile Institute of Pakistan on Wednesday where renowned experts will share their views. The conference is aimed at seeking to engage stakeholders to comprehensively discuss the plan to streamline Pakistan’s textile industry and revisit and address the concerns of the companies. President Ecommerce Gateway Pakistan, Dr Khursheed Nizam said that the Fair will help introduce overseas suppliers of textile and garment materials, accessories, parts and machinery to the textile and garment industry of Pakistan and complement their efforts for high quality, value-added products and assist them to further develop their business in the export markets. 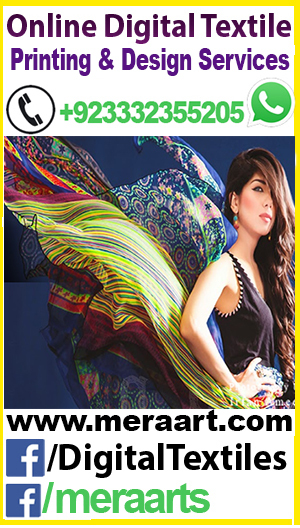 Pakistan Readymade Garments Manufacturers & Exporters Association (PRGMEA) and Ecommerce Gateway Pakistan are jointly organizing a three-day 17th Textile Asia – International Textile & Garments Machinery Trade Fair at Karachi Expo Center from 28th March, 2017. PRGMEA Chief Coordinator Shaikh Muhammad Shafiq said that this trade fair is expected to be visited by 65,000 people from trade and corporate sector as well as more than 1,500 foreign delegates. The focus of this trade fair is value addition in Textile industry to increase the export of our value-added textile and garment products. 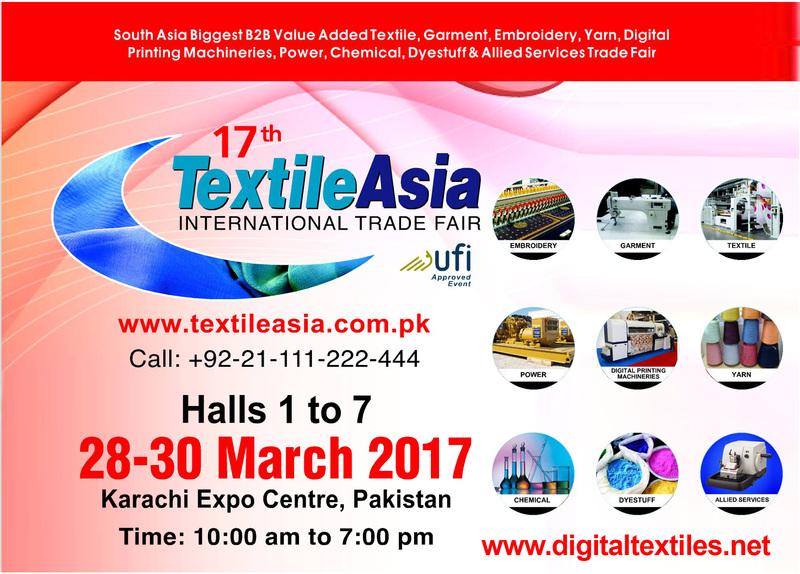 This 3-day trade fair will held from 28-30 March, 2017 and has been termed as the Pakistan’s biggest B2B textile, garment, embroidery, digital printing machineries and chemical and allied services Fair. More than 1,000 International Brands will display their products in over 800 Booths and over 1,500 foreign delegates from 27 countries mainly from Austria, China, Czech Republic, France, Germany, India, Italy, Korea, Taiwan, Turkey, UK, USA etc. will grace the events. 17th Textile Asia 2017 will also host Textile Asia Conference 2017 jointly organized with Textile Institute of Pakistan (TIP) on 29th March, 2017 which will be led by renowned experts and it will seek to engage stakeholders to comprehensively discuss the plan to streamline Pakistan’s textile industry and revisit and address the concerns of the companies. President Ecommerce Gateway Pakistan, Dr. Khursheed Nizam said that Textile Asia is the only UFI (Paris) approved Textile trade fair in South Asia, which showcases immense buying selling potential of textile, garment and allied industries and poised to introduce overseas suppliers of textile & garment materials, accessories a& parts and machinery to the textile and garment industry of Pakistan and complement their efforts for high quality, value added products and assist them to further develop their business in the export markets. This entry was tagged 17th Textile Asia 2017, CFT Asia 2017, digital textiles exhibition, Garment Machinery Show, Garments Machinery Trade Fair, International Clothing Textile, International Textile exhibition, International Textile Fair, Karachi Expo Centre, PRGMEA, Textile Asia 2017, textiles Trade Fair. Bookmark the permalink.